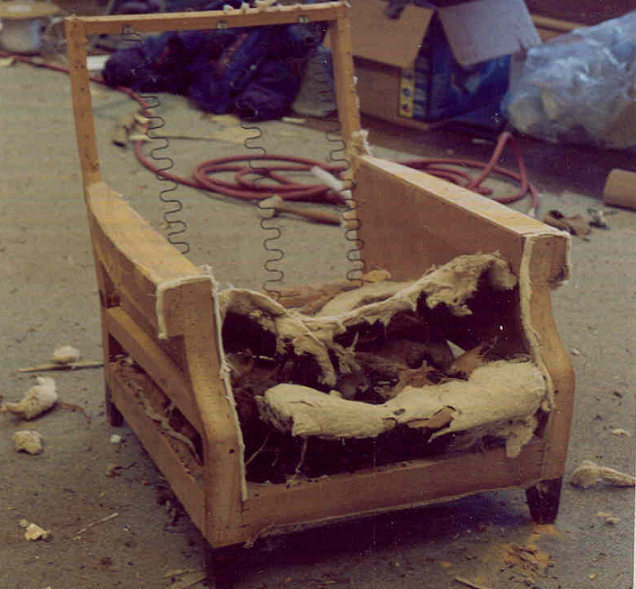 Almost any piece of furniture is salvageable, even if it looks like it’s falling to bits. A wildly uncomfortable seat may only be suffering from poorly tied or worn out spring twine. Old pieces are better made than almost anything you would buy new. New furniture is usually put together with staples, junk lumber, cardboard instead of webbing, etc. I've seen the insides and I know. You like your piece of furniture. It means something to you. Every time you sit in it you think of Aunt Frieda; when you fix it, you and future family members will be forever connected to Aunt Frieda. You help to keep a craft alive. 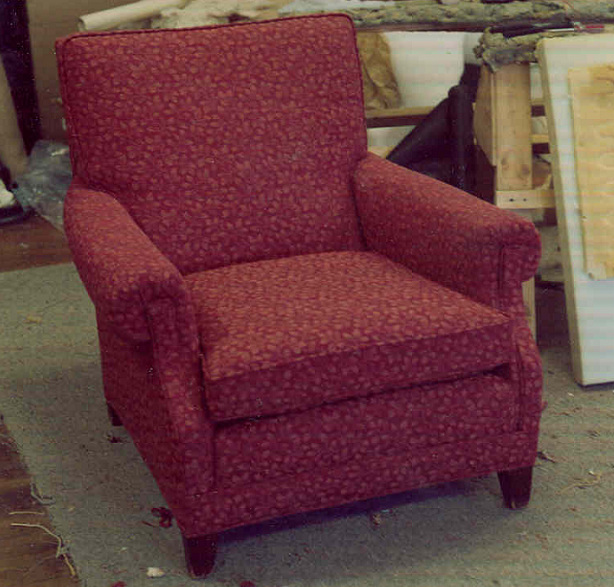 Reupholstery can only be done one chair at a time; assembly-line techniques are not possible. It is still is taught with the apprentice-master system, because it is difficult to learn from a book. You are not contributing to the throw-away society. 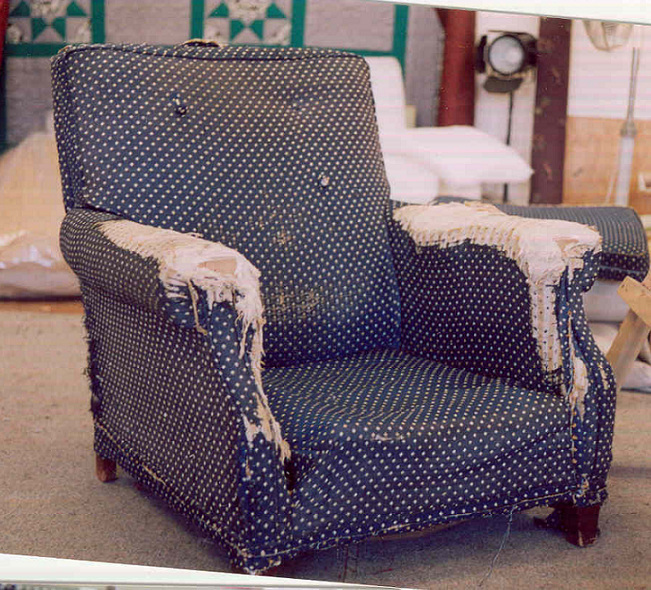 Traditional upholstery is an eco-friendly trade: we reuse most of the innards and, whenever feasible, we steer customers away from foam – an expensive and fossil-fuel material with a brief lifespan. Ask yourself, If I don’t fix it, what is to become of the piece? Into the dumpster? Yikes! You are contributing to the old-time craft economy and your local economy. And incidentally, the more people choose upholsterers, the more the suppliers of materials stay in business. For instance, the suppliers of Irish linen and scrim, Italian spring twine, my horse hair supplier in Philadelphia, to name a few, are hanging on by, um, a thread, but are crucial to the trade. It may, in fact, be less expensive. Tell us what your budget is, and most likely we can work within it. You don’t have to go chair shopping.